These are the kind of books which make winter worthwhile. 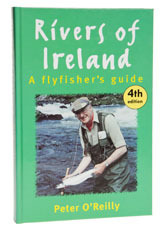 I suppose it is sufficient tribute to Peter O'Reilly that 'Loughs' and 'Rivers' have made it into their 4th and 7th editions respectively and they are about as near to being best sellers as any fishing book is likely to get. When you have sorted through your kit, given up on repairing your waders, tidied up your fly boxes and filled the gaps, you should sit down with these two, even if you have no intention of ever going to Ireland. If you do want to go to the emerald isle, there isn't a better guide, because Peter hasn't missed much. The layout is as clear as can be, and the contents are bang up to date. These ought to be on everyone's bookshelf. There isn't much to say about them other than to point out that inevitably, there are a few errors, but that there is no way that a book like this can be perfect. Good concise guides which would be hard to better. The illustration shows the 4th edition. Merlin has given up sending me new editions because they come out so fast that I get confused.